You will see all the major stars such as BRIAN BUCHANAN and TIM BELKNAP, MIKE QUINN, OWEN NEIL, RONALD MATZ and ED KAWAK. This DVD covers the Amateur and Professional class PREJUDGING competition. You will see all the major stars such as BRIAN BUCHANAN and TIM BELKNAP, MIKE QUINN, OWEN NEIL, RONALD MATZ and ED KAWAK. 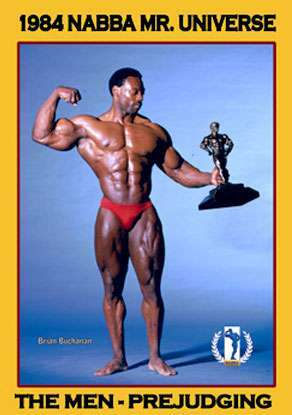 In the only DVD from the 1984 NABBA Mr Universe, the hot favourite Ronald Matz of Germany placed 2nd in the tall class to Brian Buchanan. See photo of the top 3 in this class at the bottom of this page. Brian Buchanan of UK won the Overall Amateur title and Edward Kawak (originally from Lebanon) won the Pro Mr Universe title. Enjoy 124 mins of some of the best prejudging footage ever recorded from the NABBA Universe. 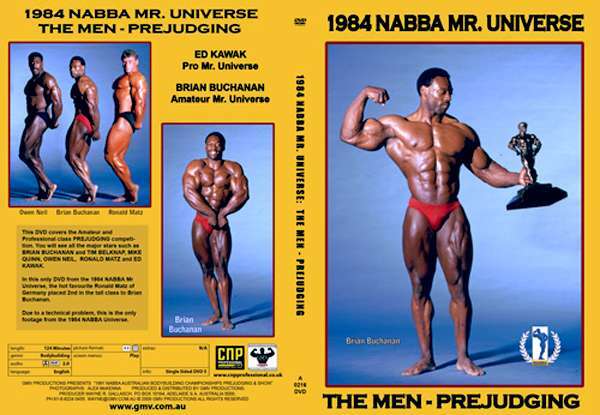 Due to a technical problem, this is the only footage from the 1984 NABBA Mr. Universe. The recording of the evening SHOW was lost. It was a great year for USA with MIKE QUINN and TIM BELKNAP both winning their classes. Joe Meeko and Larry Bernstein each got 2nd placings and Lance Dreher got a 3rd.